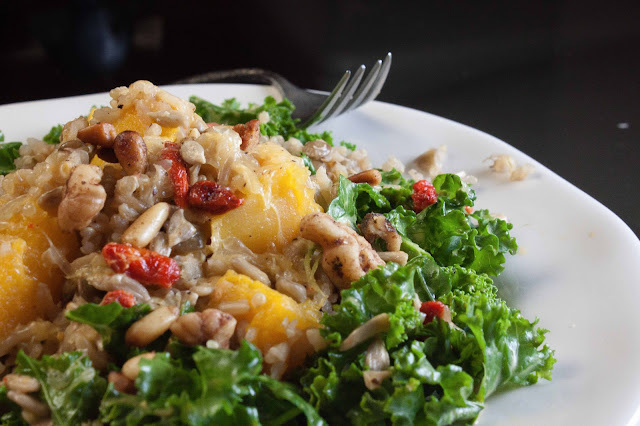 I can't get enough of this salad; I've made a variation of it for three different gatherings in the last week and the reviews are glowing. Warm comfort foods are a must of you live in a cold climate, but often those foods are covered in artery clogging, fat-laden meats, creams and cheeses. And they can be so overcooked that they leave you feeling full and lifeless. 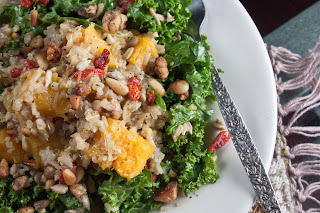 Finding myself in the midst of a detox during the above noted gatherings and one them them landing on Meatless Mondays lead me on a quest to create a healthy comfort dish that was warm, filling and tantalizing to the taste buds. The warmth of the squash and quinoa slightly soften the kale while the lemon goji berry dressing keeps the whole salad lively and fresh. And the salad is so versatile you can add and subtract other veggies based on your seasonal veggies and what you have on hand. 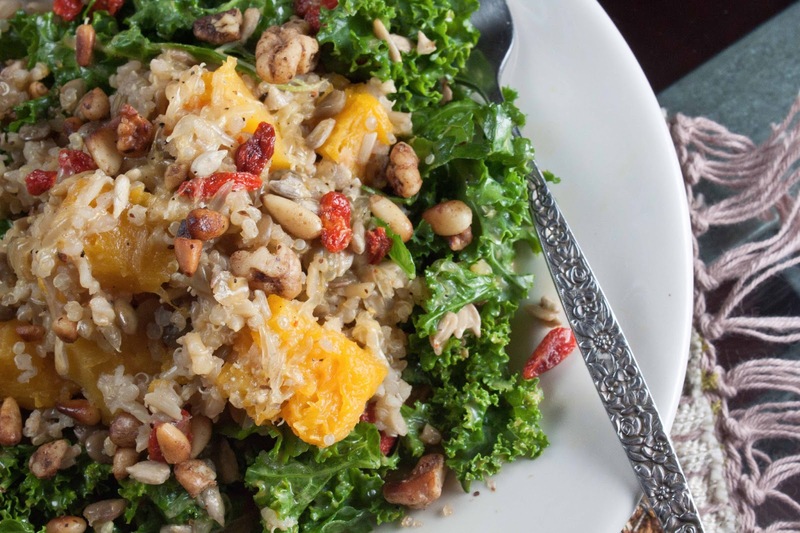 Stay warm, filled and fueled with this Fat and Happy Warm Squash, Quinoa and Kale Super Foods Salad with Lemon Goji Berry Dressing. Fat and Happy Food Blog Tips and Techniques: For ease, pre-make the squash, quinoa mixture and the dressing up to a few days prior to serving the salad, simply rewarm just before serving. You will have extra quinoa mixture; save for use in other salads, soups, stews, toss with cinnamon and maple syrup for breakfast, stuff in a pita or form into veggie burger. Roast the squash: Cut, peel and clean the squash. Dice into bite-sized pieces, toss with a drizzle of olive oil and roast at 400 degrees until just fork tender. I toss the squash seeds on the tray and roast them at the same time. Cook the quinoa, brown rice, lentil mixture: Boil the water (or broth), add in the rinsed brown rice, minced red onion and garlic. Simmer covered about 10 minutes. Add in the rinsed lentils, cover and continue to simmer 10 more minutes. Add in the rinsed quinoa and turmeric powder and simmer until desired texture is reached, about 10-or 15 minutes. Whip the dressing: Blend the sesame seeds, olive oil, parsley, goji berries, lemon juice and a pinch of salt and pepper. Serve while warm for the best flavor; but room temperature is good as well. This make a very large salad; feeds 5-10 people. Adjust amounts for your needs.